I’ve been thinking about Center Field today. Perhaps it’s because the Gwinnett TV announcers last night kept calling it “the easiest position to play” in the outfield. I know what they were trying to say, that because you can see the entire field and your view of the ball coming off the bat is truer, it may be the easiest spot to get a read on the trajectory of the hit. However, I always think of Center Field as a premium defensive position–an “up the middle” spot where a player might be defined by his defense as much as his offense. Indeed, an outfield player trying to make a Major League roster as a bench player will need to prove that he can back up the starter in Center Field. 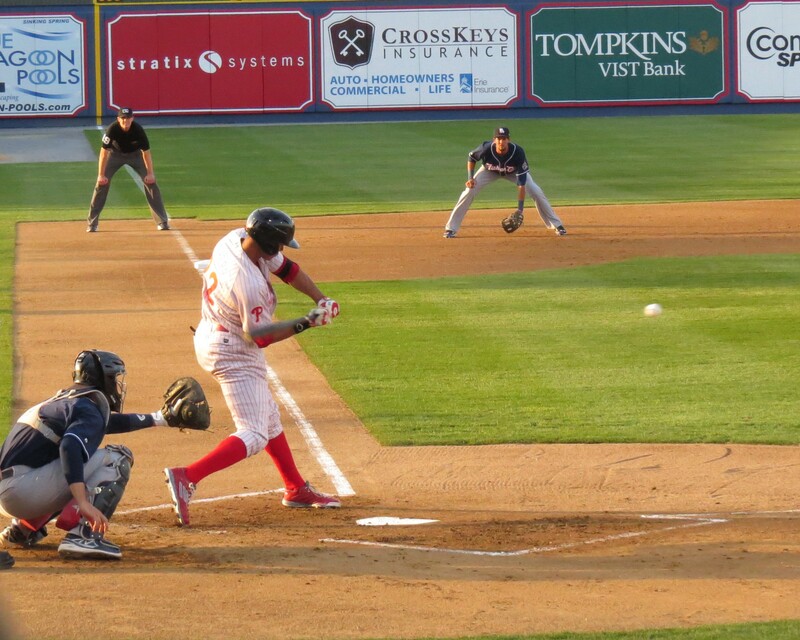 That’s a bit of what’s going on with the IronPigs right now; Jordan Danks, who’s on the Phillies’ 40-man roster, and veteran Brian Bogusevic are manning Center Field most nights as they attempt to make the Phillies’ big club as a utility outfielder–although neither are what you’d call “true” center fielders in the sense that their defensive play defines them as players. Darin Mastroianni was more of a true center fielder, but he was let go earlier in the season to make way for Danks and Bogusevic. We haven’t seen it much, but Chase d’Arnaud can play Center Field as well on a utility level. He’s been mostly at Shortstop with the injury to Edgar Duran. 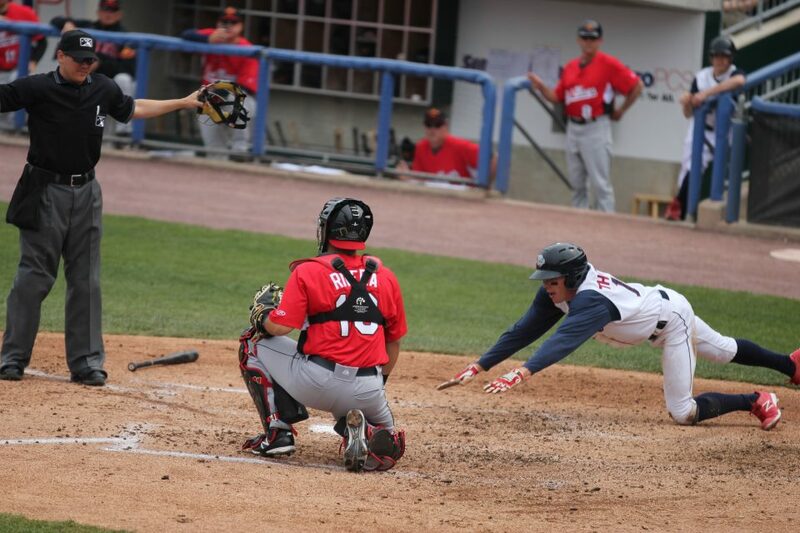 Historically, for the IronPigs, the defining center fielder was Rich Thompson. He never quite had the bat to spend much time in the big leagues, but he could play excellent center field, lead off a lineup, get on base, and steal bases on the AAA level well enough to hold the job for many years–and become a fan favorite in the process. It’s not quite clear to me what’s going on with the Phillies right now. Well, I kind of suspect it has to do with where we’re going next, but Ben Revere had been the guy they brought in to man that position. He can hit for average–just missed the batting title last season–and steal some bags. 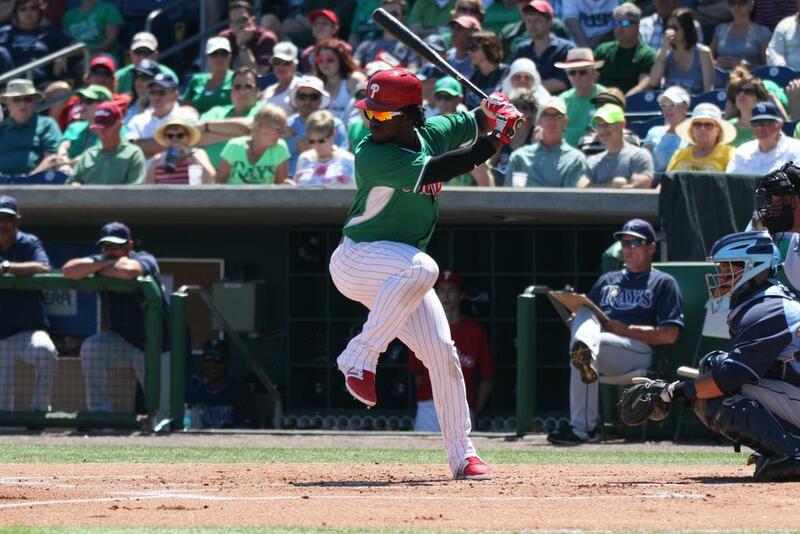 This season, they brought in Odubel Herrera via the Rule 5 draft, a converted second baseman. He’s been in center most nights. The thinking–I guess–is that he may be able to play a little better defense in center compared with Revere, and that he may be able to hit for a bit more power. However, because he hadn’t played above AA before this season, he may be a bit of a work-in-progress. No, probably the name plate on the center fielder’s locker in Philadelphia is engraved with the name Roman Quinn. Quinn is in Reading right now, and for the most part, he’s been tearing it up. He has speed to burn (!) and the ability to make extra plays in the outfield, and hit the ball from both sides of the plate. He may be able to develop a bit of a power stroke as well. If I’m understanding “Ruben’s Plan for Player Development” properly, he’ll likely spend the entire season in Reading, where top-prospect Shortstop JP Crawford will join him before too long. In the mean time, another player has had very little chance to develop his game in Center Field. Aaron Altherr, who spent some time in Reading last season as well, has been playing mostly in the corner outfield positions. He has the ability to be, if not a spectacular defensive center fielder, better than a utility-replacement. Ultimately, on the big league level, that might be what he becomes–but he needs the chance to develop both his defensive game as well as his play at the plate. He’s been hitting better this season, taking more walks, and striking out less. Outfield changes are on the horizon. I don’t know when, because I haven’t been told the details of the “Ruben Development Plan.” I’m not “bitching” about it, you see–and I’m probably smart enough to understand it. I just haven’t been told. Soon, Dom Brown and Cody Asche will be back with the Phillies, and playing in the corner positions. Odubel will probably remain in Center Field most nights. It will remain to be seen whether Sizemore, Francoeur, and Revere will continue with the team, via trade or otherwise. Bogusevic might get a chance to move up, and Danks might not. We’ll see. But by then, Altherr should be playing center field in Allentown for the remainder of the season. What’s next? Well, there’s a kid in Clearwater named Aaron Brown. He’s a big lefty drafted out of Pepperdine last season, who had also been a pitcher. He’ll likely start in Center Field for the Reading team in 2016. Another guy worth mentioning is 19 year old Carlos Tocci, the centerfielder at Lakewood. Tocci was given a $759,000 signing bonus when he was just a 16 year old prospect from Venezuela but his development in his first few years has been slow. But this year he has started 44 games at Lakewood, all of them as a centerfielder. 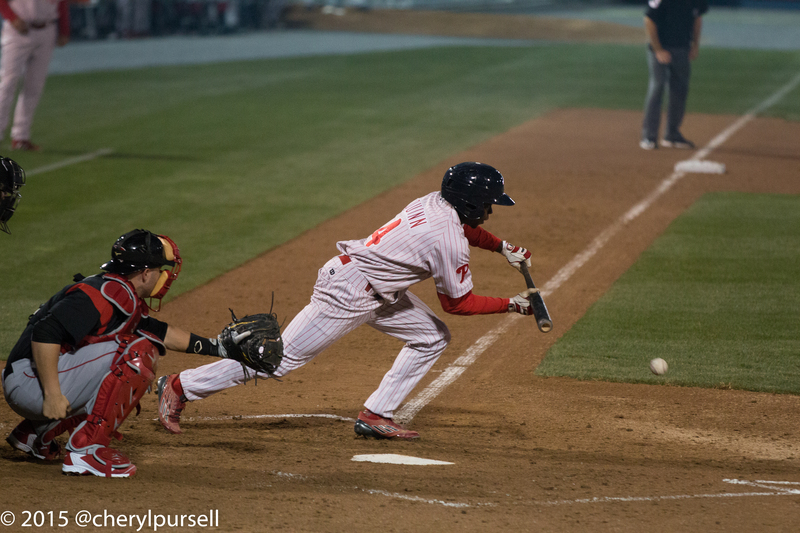 Currently, he is hitting .335 in 179 at bats which is second best in the South Atlantic League. MLB currently has him #18 on the Phillies list of prospects. He’s big (6’2″) and fast but he needs to add some weight/muscle to his 160 pound frame. For now he’ll probably follow Aaron Brown up the ladder. He doesn’t turn 20 until August 23rd so there’s no need to rush. FYI: Top 50 Draft Prospects special on MLB Network Sunday night at 10 PM. The Phillies can’t afford to miss with the 10th pick in the draft on June 8th. I agree. Tocci (and Hoskins) are top candidates to move up to Clearwater once the movement begins–hopefully shortly. I don’t really see Brown moving to Reading yet, so I’d imagine he’ll be in a corner spot once Tocci gets there. It’s his third year in Lakewood, but as you point out, he’s always been the youngest player in that league until this season. A big point on another board recently was that he’s gonna need 40-man protection and every option he can get in order to move up at a normal pace, because he started so early. Here’s hoping he moves quickly. I also agree on Phillies at 10. This is not place/time to take silly risks. Pick as “sure” a thing as you can regardless of position, I say. I’ve been following most of the mock drafts online. While Aaron Nola was an almost unanimous choice for the Phillies last year, the predictions this year have yet to narrow it down to 1 or 2. Interesting that 1 of the names being mentioned is SEC Player of the Year Andrew Benintendi from the University of Arkansas who happens to be a center fielder, but many think he’s better suited for a corner. He just finished his sophomore year and hit .391 with 18 HR and 52 RBI.